ANS 37:3 – “Health Equities” just released! The new current issue of ANS is now available online! 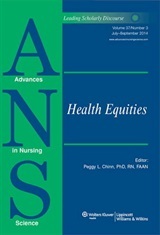 This issue, focusing on “Health Equities,” affirms the conviction upon which many nurses historically have built their practice – a conviction that social inequities have profound health consequences. 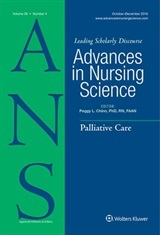 The articles in this issue add to a growing body of literature that provides depth and breadth to expand nursing’s disciplinary perspective on social justice as central to our mission. Each article will be featured on the ANS blog over the next several weeks, so watch this blog to learn more about each author’s important work. Watch for the “Editor’s Pick” on the ANS web site over the next several weeks – each of the articles in this issue will be featured for a couple of weeks. While each article is featured it will be available for free download! These articles are all very thought-provoking, and we welcome your responses and comments here on this blog!